DIE Martis, videlicet, 21 die Junii. Symons's Suit, against Sir Jo. Wollaston, stayed. Message from the H. C. about the Forces raised by the Adventurers for Ireland, and for Ld. Wharton to command them. Ld Wharton approved of, and to see the Officers take the Protestation. Mr. Courten's Ship, laden with Salt-petre, to be bought for the Public. Message to the H. C. for that Purpose. Vote about the Actors in the Leicestershire Commission of Array to be printed. Letter from the King to the Speaker. Answer from thence about the Salt-petre. Letter to be sent to the King's Secretary, for the Royal Assent to Two Bills. Declaration of some Lords at York, importing a Preparation for War against the Parliament. Committee to consider of it. Counsel to be present at the Examination of the Irish Prisoners. 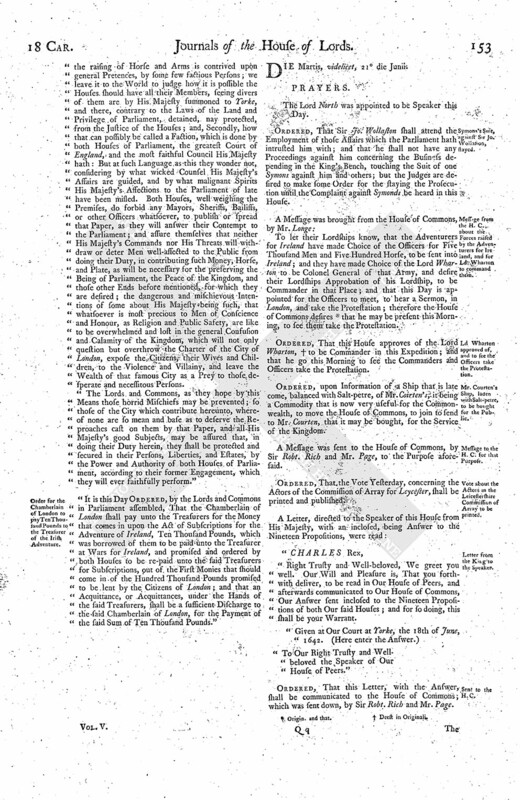 Declaration concerning the King's Letter to the Lord Mayor to be printed. Letter to the Mayor of Exeter. Enquiry to be made what Room there is in London for the Magazine from Hull. Letter to the King's Secretary. Message to the H. C. for Committees to meet about an Answer to the Declaration of some Lords at York, printed in the King's Name. The Letter written to the Mayor of Exeter from the Speaker. Ordered, That Sir Jo. Wollaston shall attend the Employment of those Affairs which the Parliament hath intrusted him with; and that he shall not have any Proceedings against him concerning the Business depending in the King's Bench, touching the Suit of one Symons against him and others; but the Judges are desired to make some Order for the staying the Prosecution until the Complaint against Symonds be heard in this House. To let their Lordships know, that the Adventurers for Ireland have made Choice of the Officers for Five Thousand Men and Five Hundred Horse, to be sent into Ireland; and they have made Choice of the Lord Wharton to be Colonel General of that Army, and desire their Lordships Approbation of his Lordship, to be Commander in that Place; and that this Day is appointed for the Officers to meet, to hear a Sermon, in London, and take the Protestation; therefore the House of Commons desires (fn. 1) that he may be present this Morning, to see them take the Protestation. Ordered, That this House approves of the Lord Wharton, (fn. 2) to be Commander in this Expedition; and that he go this Morning to see the Commanders and Officers take the Protestation. Ordered, upon Information of a Ship that is late come, balanced with Salt-petre, of Mr. Coirten's, it being a Commodity that is now very useful for the Commonwealth, to move the House of Commons, to join to send to Mr. Courten, that it may be bought, for the Service of the Kingdom. A Message was sent to the House of Commons, by Sir Robt. Rich and Mr. Page, to the Purpose aforesaid. Ordered, That the Vote Yesterday, concerning the Actors of the Commission of Array for Leycester, shall be printed and published. "Right Trusty and Well-beloved, We greet you well. Our Will and Pleasure is, That you forthwith deliver, to be read in Our House of Peers, and afterwards communicated to Our House of Commons, Our Answer sent inclosed to the Nineteen Propositions of both Our said Houses; and for so doing, this shall be your Warrant. "To Our Right Trusty and Well. beloved the Speaker of Our House of Peers." Ordered, That this Letter, with the Answer, shall be communicated to the House of Commons; which was sent down, by Sir Robt. Rich and Mr. Page. That they have delivered the Message to the House of Commons, concerning the Salt-petre. Ordered, That a Letter be sent to the Secretary, signed by the Speaker, to desire him to move the King, to send His Answer for the passing the Royal Assent to the Bill concerning the Synod, and the Bill for the Adventurers of Ireland. That they have delivered the Letter, and the Answer from the King. The House was informed of a Book, printed (as is alledged) by the Command of the King, wherein there is a Declaration of some Lords at Yorke, which imports a Preparation of a War, and an Opposition to the Parliament. E. Lyncolne. L. Viscount Say. Any Five to meet this Afternoon, at Three a Clock. Ordered, That Serjeant Ayliff, Serjeant Whitfeild, and Serjeant Fynch, and Serjeant Glanvile, or any Two of them, shall be present at such Times as the Lord Chief Justice of the King's Bench and Justice Mallett, or any One of them, shall take the Examinations of Mac Gwire, Mac Machowne, and Colonel Reade. The Lord Admiral reported, "That the Lords Committees were Yesterday at London, to acquaint them with the Declaration concerning the King's Letter to the Lord Mayor, &c. and the City shewed much Forwardness to observe their Lordships Commands; and the Lord Mayor desired the said Declaration might be printed, and published to the several Wards in London;" which was accordingly Ordered. The Letter to be sent to the Mayor of Exeter was read, and approved of, and Ordered to be subscribed by the Speaker of this House. Ordered, That the Lord Wharton and the Lord Brooke do give an Account To-morrow, what Room there is in London to lay the Magazine in that came from Hull; and to enquire whether Mr. Kellgrewe's Horses, that are stayed in London, be War-Horses or not. The Letter to be sent to Mr. Secretary Nicholas was read, and approved of; and Ordered to be sent and subscribed by the Speaker of this House. To let them know, that this House hath appointed a Committee of Thirteen Lords, to consider of the whole Declaration lately printed in the King's Name; and also to consider what is sit to be done thereupon, by Way of Answer or otherwise; and the said Committee is to sit this Afternoon, at Three a Clock, in the Painted Chamber; and that this House desires the House of Commons to appoint a Committee, of a proportionable Number, to meet the said Lords, at the Time and Place aforesaid. 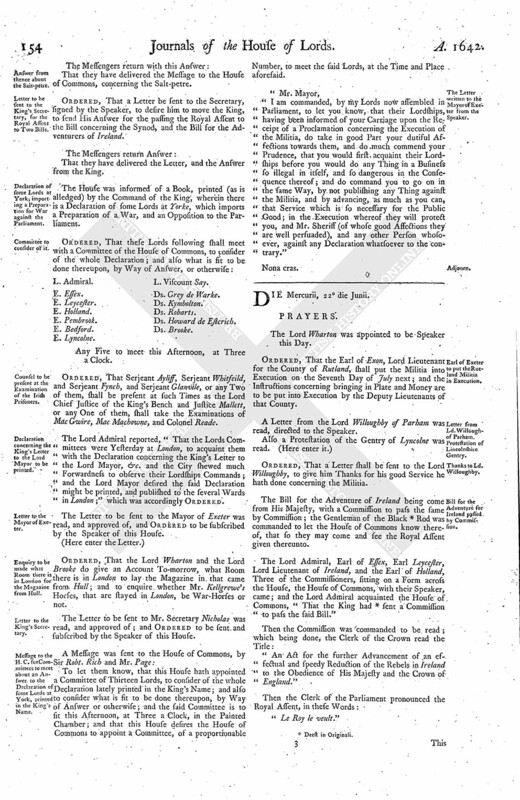 "I am commanded, by my Lords now assembled in Parliament, to let you know, that their Lordships, having been informed of your Carriage upon the Receipt of a Proclamation concerning the Execution of the Militia, do take in good Part your dutiful Affections towards them, and do much commend your Prudence, that you would first acquaint their Lordships before you would do any Thing in a Business so illegal in itself, and so dangerous in the Consequence thereof; and do command you to go on in the same Way, by not publishing any Thing against the Militia, and by advancing, as much as you can, that Service which is so necessary for the Public Good; in the Execution whereof they will protect you, and Mr. Sheriff (of whose good Affections they are well persuaded), and any other Person whosoever, against any Declaration whatsoever to the contrary."